Facebook’s Slideshow is a customized, high-quality video based on a series of your photos. Slideshow lets you quickly and easily combine multiple images, text, and sound to capture your audience's attention and tell a story with photos. Build a fun and engaging video quickly and easily. Display your products, events photos, or tutorials. Reach people on mobile devices or with slow internet connections. Want more people to see it? Click Boost Post and add the audience, budget, and schedule you'd like for your boosted post. Click Boost to place your order. Slideshow videos are “lightweight,” meaning they’ll easily stream for people on mobile and with slow internet connections. 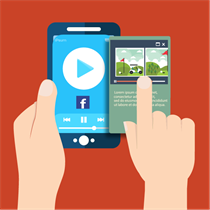 Mobile video has grown 170% since 2013 and over 50% of Facebook users login ONLY from a mobile device. Are you maximizing your market reach? Get 30 more quick and easy ideas for social media posts in our popular infographic.